Zinnias have been reliable as easy bouquet builders this summer and they continue to bloom gloriously. But for something different today I feature two other garden mainstays, echinacea and rudbeckia. 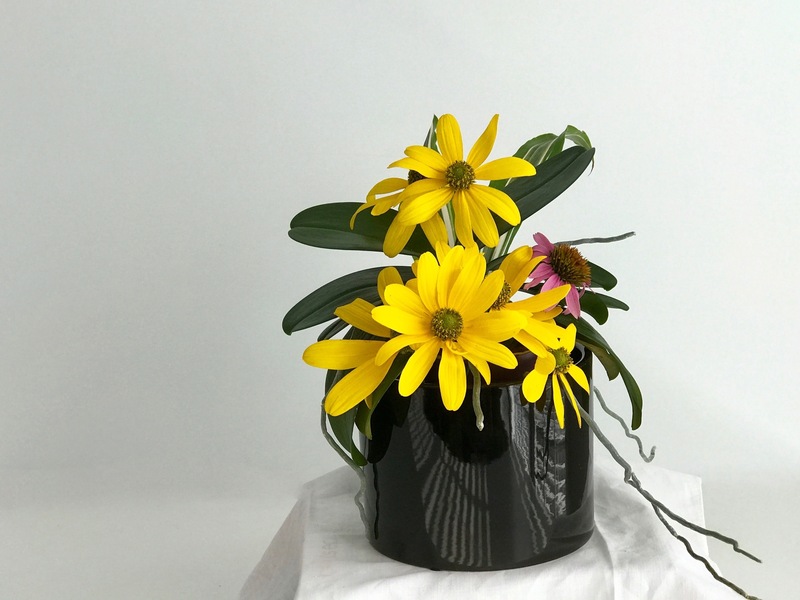 A small out-of-bloom Phalaenopsis orchid tucked into a shiny glazed black container was the starting point of this design. A freshly emerged purple coneflower was inserted next. Many coneflowers are dotted around the garden, most of which are sporting dried seedheads at this point in the season to the delight of the local American Goldfinches. Three stems of Rudbeckia laciniata or green-Headed coneflower were tucked among the dark green orchid foliage. A couple of patterned Lemon Lime warneckii leaves were used to add some height and color variation. As always a big thanks to Cathy at Rambling In The Garden for hosting and giving us a chance to express our flower arranging passion. Visit her to discover what she and others found this week in their gardens to place In A Vase On Monday. To follow up on last week’s solar eclipse I thought I would share a few pictures. Yes, I do wish we had bought glasses so we could have viewed the eclipse directly, but we had fun. Here is an image through a pinhole in a paper cup. 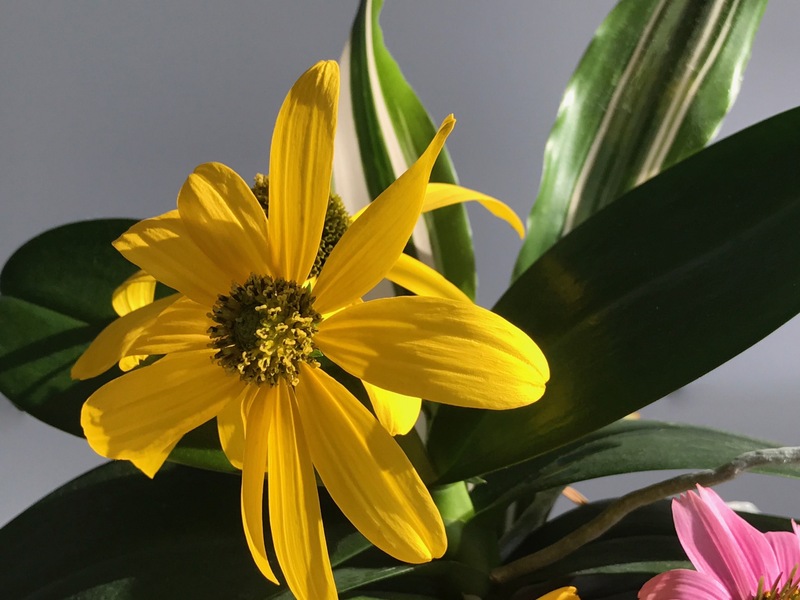 This entry was posted in garden and tagged 2017vase, eclipse, flower arranging, flower design, in a vase on monday, nature photography, Rudbeckia laciniata (Green-Headed Coneflower) on August 28, 2017 by pbmgarden. Clever flowers today Susie but I’m afraid they they were outshone for me by the last image of the eclipse though the colander – it’s amazing; very very clever of you to think of doing it. Yes the colander was cool. The eclipse was heavily hyped in the days before the occurrence, so I saw the colander tip in a newspaper article. Made the shadow much more interesting for those of us who relied on an indirect view. 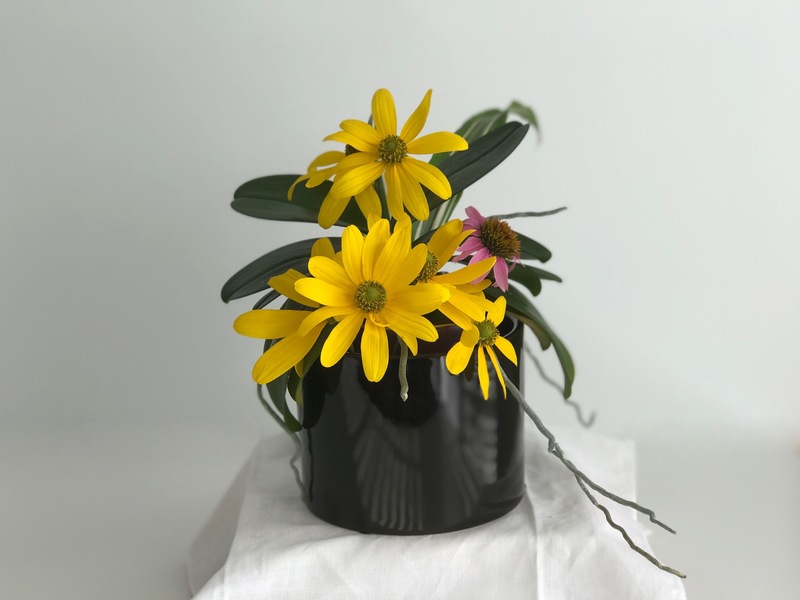 I love these August daisy flowers and how good they look in your lovely dark pot. Like Christina I am impressed by your colander eclipse. Both Rudbeckia laciniata and Echinacea purpurea are insect magnets, attracting attention even as I carried them toward the indoors. The colander experiment was great fun. There were also lovely effects created by shadows of leaves on the grass or sidewalk. Very clever use of the orchid! Love this simple and effective arrangement. I didn’t buy special glasses either but very much enjoyed viewing the interesting shadows (projections?) 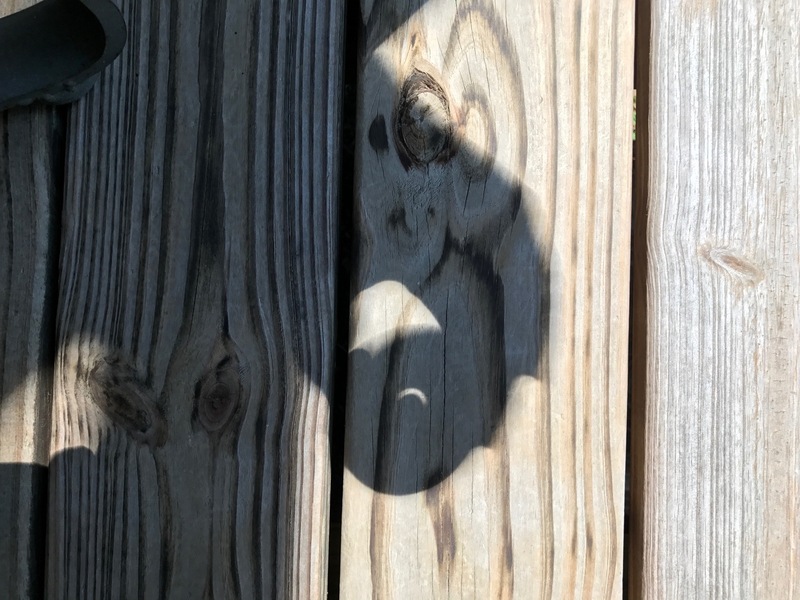 cast by the eclipse through tree leaves all over the ground. Decided to put the orchid to work as the foliage is always interesting. Oh yes, some of the most interesting photos from the eclipse were filmed through the leaves. 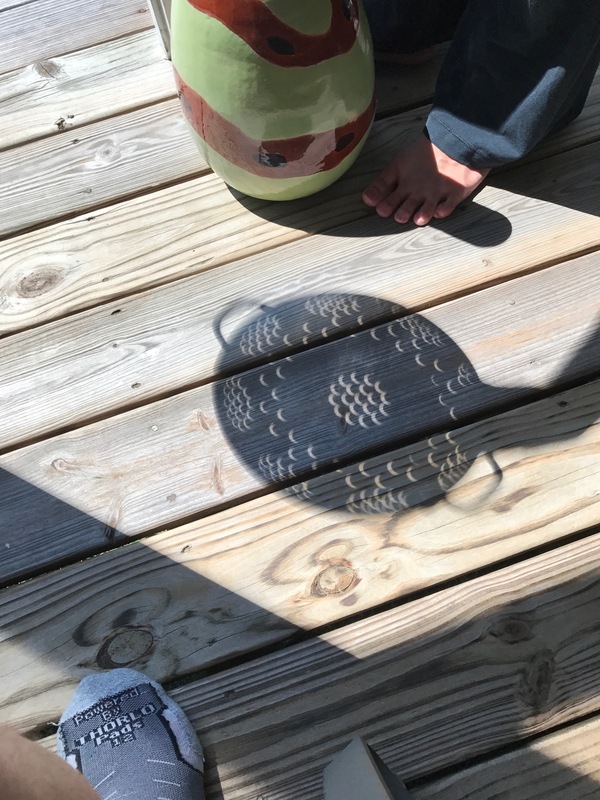 The colander shadow is fabulous. We say similar patterns on the street as the crescent light shone through trees. I didn’t realize how interesting the leaves would be until almost too late. Caught a view shots nearing the end. What a beautiful arrangement. I was going to say it looks so simple, but obviously it was not. I wish I had of thought of the colander idea while we were looking at. I think the pictures are so neat. Thanks Lisa. The arrangement was quick to assemble but the rudbeckias kept shifting as I tried to photograph them, so that part actually took longer. The colander was a rewarding consolation since we didn’t have the glasses. 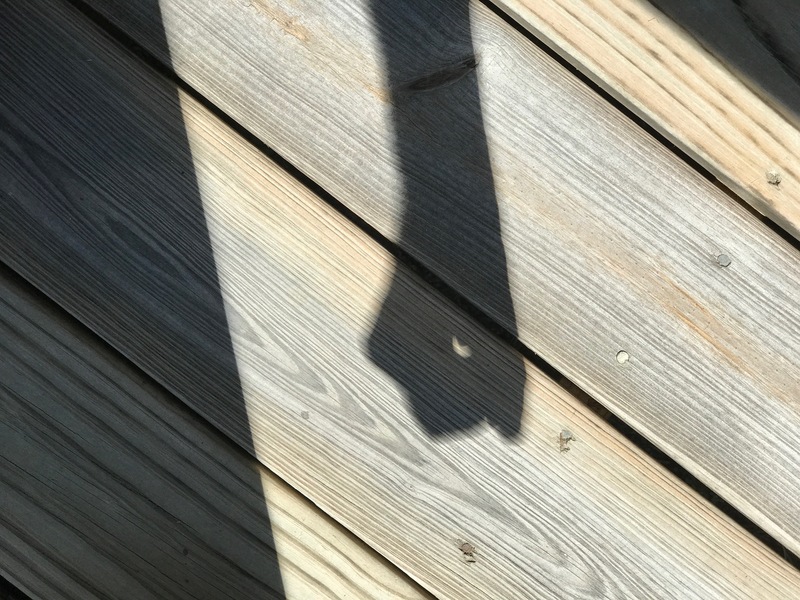 Oh I love those eclipse photos….very creative. 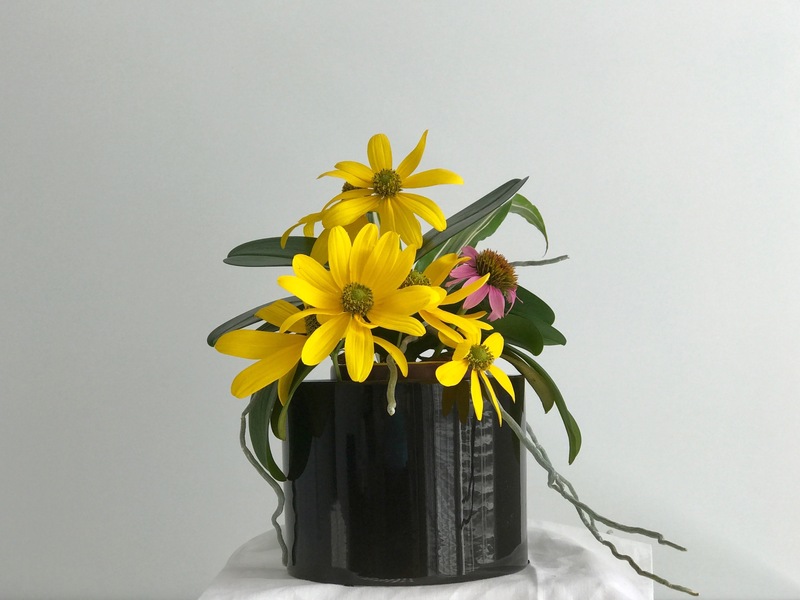 And what a fabulous ceramic vase for those bright natives, rudbeckia and echinacea! Thanks Donna. These two natives have been very reliable and long-blooming. The insects have been pleased. Thanks Annette. Hope you have a great week. So simple and so effective – as was the colander trick too! Thanks Cathy. The colander images made us smile. Using the Phalaenopsis to support the flowers was a very clever idea, Susie! You got better eclipse photos than I did. Your colander effect was wonderful. Our marine layer interfered with shadow effects in our location. I love orchids but don’t like giving them the counter space when not in bloom. Glad i found a way to put one to work. Such poise and elegance. I especially like the slightly darker second photo in which the yellow rudbeckia glows against the darkness of the wall, like a yellow field against a stormy sky. Like the others, I also greatly admire the colander eclipse! Thank you. That second photo is one of my favorites too. The light shifted constantly while I was taking pictures–should have exploited it more. A delightfully sunshiny vase. It looks like you had fun at the eclipse. Great pictures. Thanks Alison. Yes, we made the most of the eclipse. Fantastic! the lighting on your arrangement is spot on and I love the colander. Thanks. The light was shifting during the brief photo shoot and I couldn’t decide how to use it to best advantage. Your arrangement definitely says ‘summer’ to me… Sunny and happy. Love the colander pinhole viewer! I can see you were closer to totality than I was. What fun it was! Yellow flowers conjure up a sunny mood. The colander elevated our experience quite a bit over just the single pinhole. All fun though. Love the late summer bouquet. Reminds to go pull something together from the garden to enjoy inside. Hope you found some beauties to bring indoors Monday Stephi. Lucky you for having the glasses. 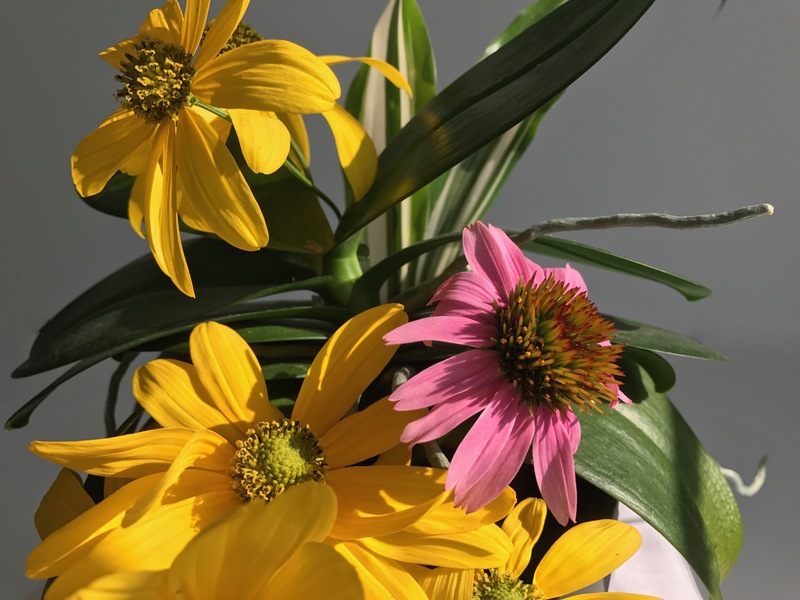 The Green-Headed Coneflower look great in a vase – so bold and cheerful! I don’t often being Green-Headed Coneflowers indoors but should think of them more often. They hold up well as cut flowers.